Steak 'N Shake is a fast food restaurant chain that offers several burger, sandwich, salad and dessert options. The franchise focuses on old-fashioned burgers and hand-dipped milkshakes. It is challenging to make healthy eating choices at restaurants that feature burgers and fries as the stars of their menu. Knowing how many calories, grams of fat and grams of saturated fat are in Steak 'N Shake menu items can help you make the healthiest choice possible. Steak 'N Shake offers over 10 burger options that include a variety of ingredients. The burgers are high in calories and fat, making them unhealthy. 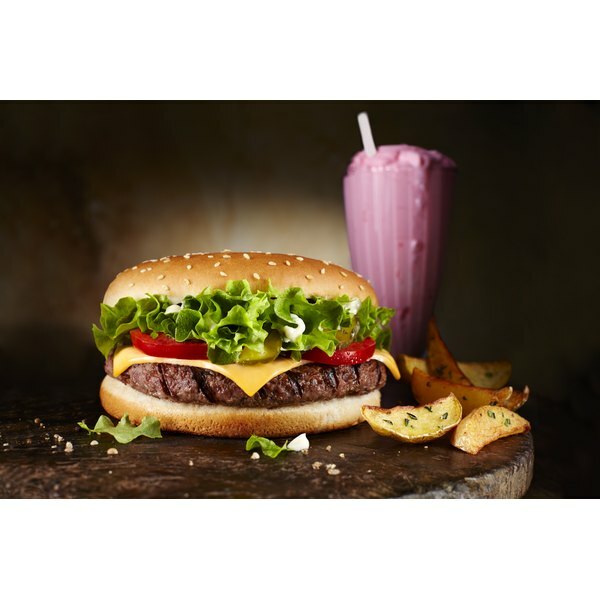 The Bacon 'n Cheese Double Steakburger has 480 calories, 28g of fat, and 12g of saturated fat. The Wisconsin Buttery Burger contains 710 calories, 49g of fat and 21g of saturated fat. The worst offender is the Grilled Portobello 'n Swiss Burger, which has 770 calories, 56g of fat and 16g of saturated fat. If you crave a burger, try the Single Steakburger for only 280 calories, 11g of fat and 4.5g of saturated fat. In addition to burgers, Steak 'N Shake offers several chicken sandwiches, cheese sandwiches and hot dogs. These are also high in calories and fat, making them unhealthy choices. The Chicken Melt has 650 calories, 38g of fat and 9g of saturated fat. The Grilled Cheese Sandwich has 400 calories, 22g of fat and 9g of saturated fat. The hot dogs are even higher in calories and fat. The Chili Cheese Steak Frank contains 620 calories, 44g of fat and 19g of saturated fat. The Guacamole Steak Frank has 490 calories, 37g of fat and 12g of saturated fat. Some of your salad choices are fairly low in calories and fat, as long as you eat them without the dressing. The Apple Walnut Harvest Salad has 300 calories, 14g of fat and 4g of saturated fat. Other salads are high in calories and fat even without the dressing. The Fried Chicken Salad has 470 calories, 26g of fat and 6g of saturated fat. Add dressing and you will be consuming around 100 additional calories and 10g to 15g of additional fat. Fries and onion rings are popular sides to accompany your burger, sandwich or hot dog. Steak 'N Shake offers a wide variety of side dishes and some are healthy, though most are unhealthy. A regular sized order of cheese fries has 610 calories, 34g of fat and 9g of saturated fat. The Bacon Cheese Fries have 670 calories, 38g of fat and 11g of saturated fat. A regular sized order of plain french fries has 440 calories, 21g of fat and 4g of saturated fat. Onion rings are even worse with 790 calories, 45g of fat and 22g of saturated fat in a regular-sized order. Healthier side dishes include Apples 'n Grapes for only 80 calories and 1g of fat or the mandarin orange cup for only 60 calories and 0grams of fat. According to "The Nutribase Guide to Fast-Food Nutrition," the desserts at Steak 'N Shake are very high in fat and calories and should be viewed as an occasional treat rather than an occasional indulgence. The Fudge Brownie Sundae has 645 calories and 35g of fat. The milkshakes are very popular but are also full of calories and fat. The Banana Milkshake has 700 calories, 23g of fat and 16g of saturated fat in a regular-sized serving. A regular-sized serving of the Mint Cookies 'n Cream Shake has 1,000 calories, 34g of fat and 20g of saturated fat. Your best bet for dessert is the chocolate chip cookie for 190 calories, 10g of fat and 4g of saturated fat. A meal at Steak 'N Shake can easily cause you to reach your calorie and fat limit for an entire day. If you choose the burger, consider having one of the fruit options as your side dish. Another side dish choice is the house salad with only 45 calories and 1g of fat. You can order your burger or sandwich without cheese or mayonnaise to help reduce fat and calories. Many of the shakes have more calories and grams of fat than the burgers, so order the small size and split it with a friend. How Many Calories Are in Half a Subway Sandwich?